Although the first studies on Kirlian photography can be traced back to the late 1700s, this method was officially invented in 1939 by inventor and researcher Semyon Davidovich Kirlian together with his wife, teacher, and journalist Valentina Khrisanovna Kirlian. The Kirlian photographic process is based on a phenomenon called electrical coronal discharge, which results in visible ‘’auras’’ surrounding the objects photographed. This photography technique is also known as ‘’electrography’’, ‘’corona discharge’’, ‘’bioelectrography’’, ‘’gas discharge visualization’’ and ‘’electrography’’. Naturally, throughout the years, these photographs have become the subject of intense debates in the photography world, myths, and even many controversies. In this article, we will briefly explain what exactly this method is. For more information about the process behind these images, you can read this article about the Kirlian technique. Also, there you will find a few more tips and advices that will help you produce your own pictures. The process behind Kirlian photographs is quite simple to understand and pull off even without using a camera. 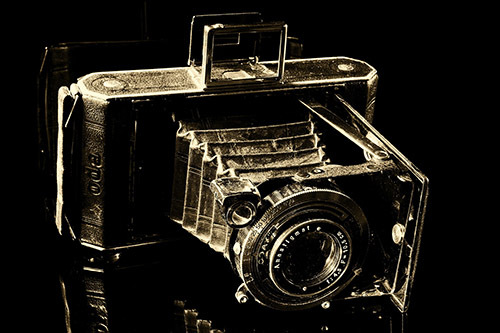 The method is quite straightforward – when placing a random object on a photographic plate which is connected to a source of high-voltage electricity, the resulting image will be printed on the photographic plate. This happens due to the electrical coronal discharge that takes place between the photographed object and the photographic plate, which is usually made out of metal. Throughout the years, scientists have conducted a plethora of studies and experiments, trying to find out the logic behind this process. During these studies, experts have used a wide variety of objects, from coins, apples, to leaves and mushrooms and, in some cases, human hands and fingerprints. Regardless of what they have used to conduct the experiment, the results were the same – they were imprinted on the photographic plate, with colorful auras and waves surrounding them. These same shapes, which not long ago were the source of great bafflement in the scientific community, were finally understood – scientists concluded that they appeared due to the subject’s moisture which was imprinted onto the plate via electricity. So, to the great disappointment of conspiracy theorists, scientists have established that there is absolutely no paranormal aspect to Kirlian photography. Now that we have briefly explained how Kirlian photography works let us talk about how you can reproduce it at home. These are all the materials that you need to create a Kirlian photograph. As for the process itself, we will briefly explain it in the following entries. First off, in order for this to work, you will have to prepare your photo plate. Fill the electrode or plasma photo plate with an electric conductive solution (tap water and salt). Next up, all you have to do is mixing them up thoroughly until the salt dissolves (making sure the water does not become cloudy) and filling the plasma photo plate up using a syringe. Before going on with the rest of the process, you have to wipe the electrode plate with a damp, dry cloth. Make sure to leave no moisture or dirt on it, otherwise, the quality of the picture will suffer. After carefully cleaning the plate, place your object on it, and attach it using a transparent tape. For beginners, it is recommended to use either a coin or a leaf as their subject, as they are much easier to attach without problems. After securing the sample, you have to position a piece of wire at the back of your subject (in our case, a coin or a leaf) using, again, transparent tape. Next up, take the opposite end of the wire and connect it to the ground. Now you have just established a clear and secure connection. There are several equally viable ways to approach this step – you can either connect the high-voltage coil directly to the electrode or simply use another piece of wire. Regardless of the method chosen, you will have to make sure that everything is where it should because you will have to turn off the lights for the next steps. Now that you have built the machine, it is time to turn off and lights and power the apparatus itself. To ensure you will obtain images with the best possible quality, you should not keep the electric current flowing for more than 20 seconds, half a minute at most. For this final step, you will need a camera that is either equipped with a high-quality lens or with a good ISO setting. Ultimately, regardless of settings, you will need a camera that is capable of taking high-quality photographs in the dark. Kirlian photography has been the subject of many myths and controversies throughout the years, mainly due to their alleged paranormal nature. However, scientists have clearly debunked these myths, demonstrating that Kirlian photographs are the result of moisture sticking to the photographic plate. If you want to try out this experiment for yourself at home, make sure to gather all the necessary materials and follow the steps presented in this article. Have fun!